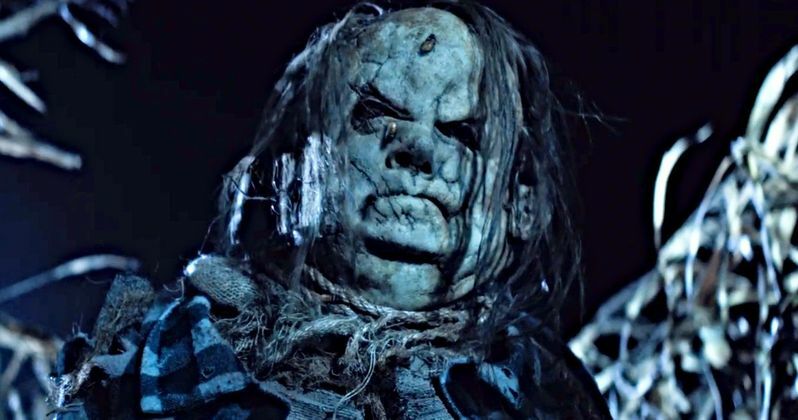 We have the first full-length trailer for Scary Stories to Tell in the Dark. There are many kids who grew up reading these books that have fond (and equally terrifying) memories of them. Despite their controversial nature, given that they're genuinely horrifying pieces of literature aimed at children, they're beloved writings that served as a touchstone of horror for an entire generation. Now, those tales are being brought to the big screen to fuel some nostalgia filled nightmares for some, while introducing these tales to an entirely new generation as well. Previously, the studio released a series of brief teasers for segments that will be part of the movie titled Big Toe, Jangly Man, Pale Lady and Red Spot. Some of these are ripped right from the pages of Alvin Schwartz's beloved books, while some of what we're going to see has been cooked up by the filmmakers. Those teasers only served to whet the appetites of horror lovers. This trailer is going to do a whole lot more than that. Scary Stories to Tell in the Dark is based on the works of author Alvin Schwartz. He wrote a trilogy of books that consists of Scary Stories to Tell in the Dark, More Scary Stories to Tell in the Dark and Scary Stories 3: More Tales to Chill Your Bones. They were published between 1981 and 1991. Combined, they contain more than 25 horror stories, many of which are based on folklore ripped straight from real-life, as well as urban legends that were extensively researched. The books have sold more than seven million copies worldwide since their initial publication, despite being controversial in nature. Guillermo del Toro, coming off of his Best Picture Oscar win for The Shape of Water, serves as a creative producer on the project. Even though he's not directing, he's been heavily involved and it's got his stamp all over it. Andre Ovredal, who is known for his previous directorial efforts such as Troll Hunter and The Autopsy of Jane Doe, is in the director's chair. The screenplay comes from Dan Hageman, with del Toro contributing to the story. Kevin Hageman, Sean Daniel, Jason F. Brown, J. Miles Dale and Elizabeth Grave also serve as producers. Studio horror has had a huge few years, with IT become the highest-grossing horror movie of all time and Jordan Peele's Us recently setting box office records in its debut. It's a great time to be a horror fan and this movie has the chance to capitalize on that increased demand from mainstream moviegoers in a big way. The cast includes Zoe Colletti, Michael Garza, Gabriel Rush, Austin Abrams, Dean Norris, Gil Bellows, Lorraine Toussaint, Austin Zajur and Natalie Ganzhorn. Scary Stories to Tell in the Dark is set to arrive in theaters on August 9. Be sure to check out the new trailer from CBS Films.